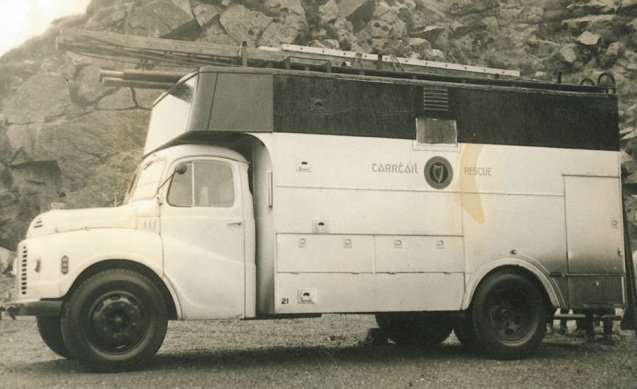 John Curran has kindly sent us the following information on the above Civil Defence truck. fleet, with box body fitted, which may have necessitated a change of reg. no. Morris Fg " Mobile Canteen Unit" Civil Defence Unit " WELFARE "
Cork City Civil Defence used this "Mobile Canteen Unit" on a recruitment campain in the 1970's. Photo Copyright Cork Civil Defence. Austin Loadstar " Rescue Truck" Civil Defence Unit " RESCUE "
Near the end of it's days RIK 687 ,1958 Austin Loadstar standing in the yard of the old central fire station at Main Street Drochaid Nua. It was stationed at Nelsons yard, Mounthawkins, Athy. Commer " Ambulances " Civil Defence Unit " CASUALTY "
A pair of 1961 Civil Defence Commer Ambulances, AZC 687 and AZC 678 at the Military Parade, O'Connell Street, Dublin. Morris Fg "Mobile Canteen Unit " Civil Defence Unit " WELFARE "
Austin Loadstar "Rescue Truck " Civil Defence Unit " RESCUE "
ZU 4996, 1954 Austin Loadstar Rescue Truck at the Military Parade, O'Connell Street, Dublin. EZE 183 Morris Fg Mobile Canteen Unit ex Cork Civil Defence , Preserved in Athy. ZU 4982 1954 Austin Loadstar Rescue Truck and 1961 Commer Ambullance AZC 684 at Cork City Civil Defence.